Nice enough. A little short for the measurements, but still worked ok.
Update the look of your bed with the Superior 300 Thread Count Solid Cotton 15-inch Drop Bedskirt. This bedskirt features a 300 thread count cotton construction with flat corners and pleats, and is available in a variety of stylish colors. Please note: Bedskirt is packaged in a way that only the white base is visible. Please open the package to confirm color. This bedskirt is perfectly nice but you can tell the fabric is not the highest quality. It's fine for the price though. Also, it is striped although the picture is of a solid fabric. I needed a bedskirt and found this one. I was concerned with the drop, I thought I would need one more with a 15-18 inch drop but the 14 inch works well, turns out I only have maybe an inch from the floor to the bottom of the bedskirt. For the price its a good deal and helps to finish off my room. I purchased the ivory color. I purchased this skirt May 2014, in King size, Gold color, for a needed color match to a goldenrod color in a quilt. The color match was perfect and as shown in the description, but everything else about this product is subpar. On initial examination of stitching, there were numerous loose threads; the threads were not tied off and when pulled would cause the seam to bunch up. The skirt material is paper thin and transparent; when hanging on the bed, you can easily see the mattress and bed frame through the skirt. The deck material, which is different than the skirt, actually feels more substantial then the skirt itself. I was hesitant about washing it and proceeded carefully, cold/cold gentle cycle and delicate dry, and examined it a second time; the skirt had already suffered signs of wear to include threads that looked snagged, surface fuzz, and color fade. I'm afraid to wash it again; I have zero confidence that it would survive. Product packaging states Luxor Treasures, Single Ply 300 Thread Count, 100% Egyptian Cotton; I have serious doubts and believe the product is falsely advertised. The Egyptian cotton is very soft, however the fabric is very thin- lightweight...You may want to trade up for a better quality skirt. (I wanted the Hotel style , on Overstocks site however they didn't have the white available in a queen size.the double pleats on each side of the bed look great. The skirt has kick openings on the front corners as well. Some reviews said this skirt had stripes, it doesn't. Bed Skirt wasn't as long as I needed. I love the color and softness of this bedskirt. However when I put it on my split king beds and I matched them up at the end of the beds it didn't reach the top. It's about 12 inches too short. I recently purchased this bedskit and although the fabric is nice quality, it's slightly too small for my bed. It's about an inch short in length and 1/2 inch short in width. I can't tell whether it's made small or if it shrunk in the dryer, since I washed it right away. It seems unlikely that a dryer would cause that much shrink. I'm still keeping it because it looks nice and no one can see the shorter side except me. The bedskirt is perfect. The color is rich, the fabric soft and not too thin. The length has the extra inches I needed for my bed. Very happy with my purchase. Over the summer we renovated an iron bed; the finishing touch was a bed skirt. It needed to be 18 inches to hide our under-the-bed storage space. Most skirts are 14-15 inches. Of those that were the right size, this was was among the least expensive. I ironed the skirt and easily put it on the bed. It looks great. I think it's a great value for the price. THE SIZE OF THE BED SKIRT WAS ABOUT SIX INCHES TOO WIDS AND THE QUALITY OF THE COTTON WAS PAPER THIN. I received my order in only a few days. I immediately opened my package to find exactly what I had ordered, an off-white, high thread-count, quality bedskirt. After I ironed the section (skirt) that would show, my partner and I put the skirt on knowing that we probably would not do that again for awhile. The skirt fit exactly and really gave the bed a finished look! I would recommend this product to anyone who loves the feel of a good cotton fabric and appreciates quality! The bedskirt was nice but it was not taupe, it was dark brown. Got it in beige and looks more dark champagne in person, very soft egyptian cotton. Of course wrinklie when washed, but with starch and ironing it looks great! simple design but looks good and neat. the white fabric that goes on mattress is more sturdy than the cheapy paper ones that come with most skirts. This bedskirt is 100 % cotton and fits the queen bed properly. It is what I needed to finish out the dressing of my bed with a pastel comforter. Yes, the bedskirt was of good quality and fit the bed fine..
A little too flimsy and the white is a little sheer. It is for our kids' beds so it is fine but wouldnt use it for my bed or guestroom. ripped the first time I put it on! I just needed a simple white cotton bedskirt. The first time I placed it on, by myself, which as you know, is a very difficult task when trying to place a heavy king size mattress over it, without the bedskirt shifting--- I finally got the mattress on, and went to sort of pull the bedskirt down at the foot of the bed, since it had ridden up under the mattress, and I heard a riiiiip! On one of the corners, it just ripped right apart! I have just tucked it back together, and the weight of the mattress keeps the corners together, but I was disappointed. I don't know if I simply pulled too hard, or if it was poor quality, but either way, it's just an average bedskirt. I didn't want to spend a ton of money on it, and I'm glad I didn't. I'm still using it, I just have to readjust the ripped corner each time I make the bed. This is of a very thin material , and requires a lot of ironing. This purchase was worth the money. I have search many places for the right fitted bed skirt for my bed. The bedskirt fits my bed perfectly. I will definitely recommend this product. Looks high-quality, easy to put on, stays in place. Would recommend. this bedskirt was perfect. it was the correct drop and I liked that it did not need pressing; I was able to use it right out of the package. Returned. Didn't use it. Nice color. Got the blue one. Very nice and fitted our king bed perfectly. Washes well. Great bedskirt but tore while I was pulling it over the box spring. "Does this have split corners in from to accommodate a frame/leg of bed?" 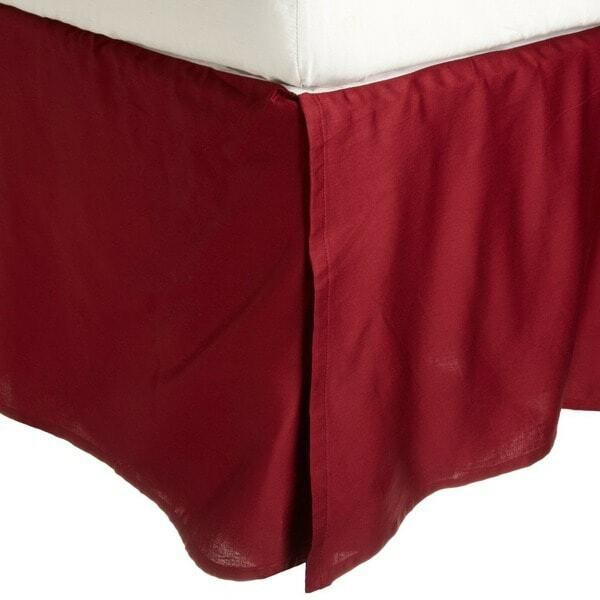 Hello sophia725, this bed skirt is pleated on the corners. Thanks for shopping with us! looks like nice tone on tone and hopefully good quality cotton. I hope the color will coordinate with the bedspread I bought. "What is the base of this skirt made of?Is it a cloth base or some paper fiber material?" Hello djhixson, this bed skirt is made of 100-percent Egyptian cotton. Thank you for shopping with us! "Do you have bedskirts with elastic top, so it doesn't need to be placed under the mattress?" Hello smiddy333, I'm sorry, but we don't carry any at the present time.Thanks for shopping with us! "I am confused, is is split corners?" "I'm looking for a bedskirt that covers all four sides of the bed - do you have one and if so what is the name of the product? Thank you"
Use the search bar, there were 49 choices. "Does this cover the bed base on all four sides, or just three?" It covers just three sides of the bed.